Style a charming Easter tablescape full of neutral colors and natural textures like moss, fern, and simple white florals. Easter is ALMOST here! Can you believe it? Time is just flying by. Earlier this month, I shared a colorful Easter tablescape but today, I wanted to share my neutral twist on the occasion. I love both styles so it just comes down to personal preference! Which one do you love the most? If you lean more towards neutral colors like beige and white and natural textures like moss and greenery, you will find lots of inspiration with this tablescape. 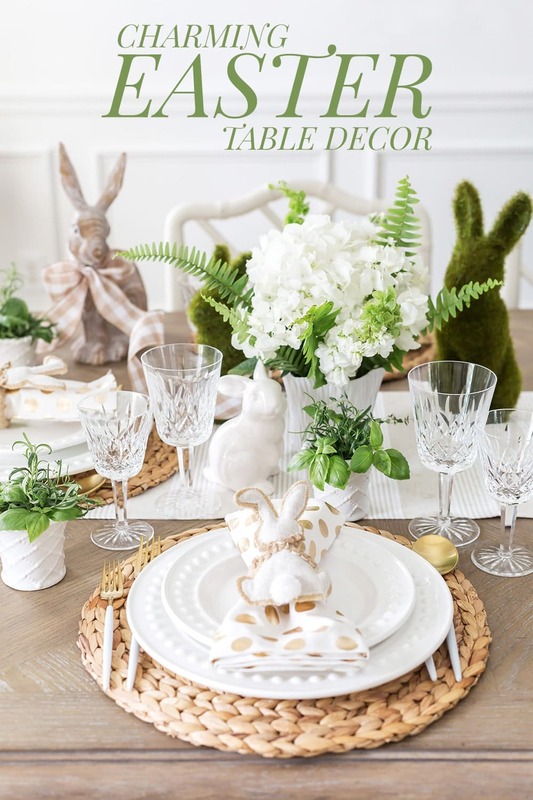 Check out some pictures and my top 7 tips for setting a neutral Easter tablescape below. Plus, I’m sharing a simply DIY for the charming bunny napkin rings. I’m a big fan of blending similar colors together. I did this with the cream and white striped table runner, tan placemats, woven beige ribbon around the napkin rings, and wooden bunnies. I contrasted that with lots of white and greenery. Moss bunnies and fresh fern sprigs from my garden added the perfect green touches. I also added fresh potted herbs in bud vases to each place setting. These make the sweetest favors for your guests. 1. Skip the tablecloth. Opt for a table runner and let your table’s natural texture show through. I picked up this simple beige and white striped table runner from HomeGoods and use it all the time. It’s a great staple! Here is a basic beige table runner that will give a similar look and feel to your table. 2. Natural placemats. I use my Natural Water Hyacinth Placemats every chance I can. They go with all colors of decor from neutral to colorful. Mine are available here from Sur La Table, but I found a more affordable option here! 3. White dinnerware. I picked up this hobnail plates from HomeGoods years ago. White plates will match any and all occasions throughout the year. They’re a great staple. 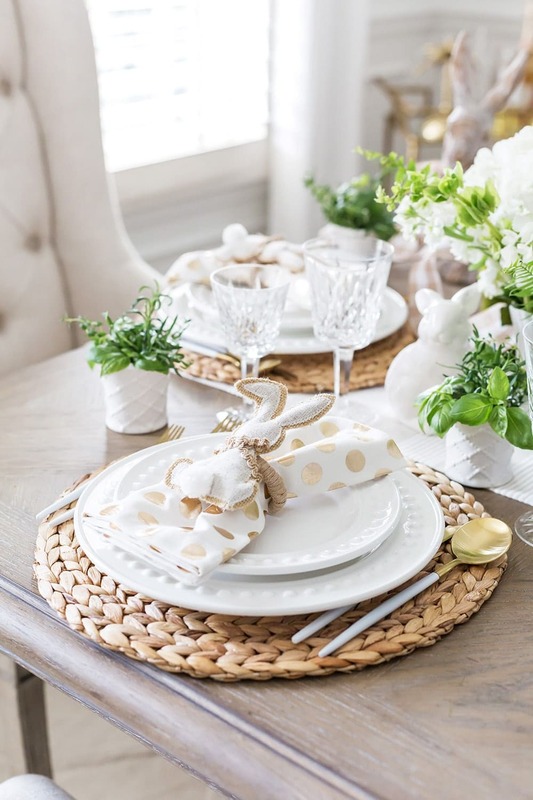 You can find a great set of white dinnerware almost anywhere! 4. Neutral bunnies. It is Easter after all, so I didn’t want to forget some Easter touches to my tablescape. I’ve collected these wooden and moss bunnies over the last few years. Sometimes I display them in my kitchen, but for this year, I grouped them together down my tablescape. 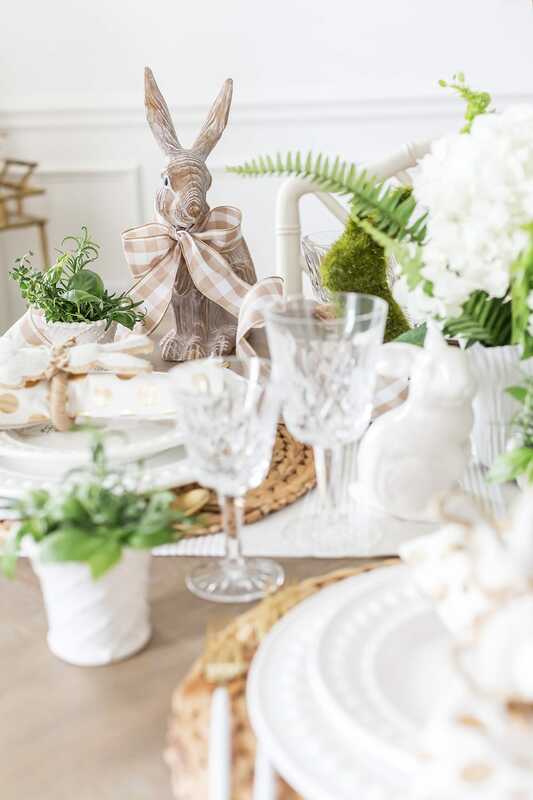 White bunnies also look beautiful for a neutral Easter table, and are very easy to find. Amazon has several cute moss bunny options though! 5. White and green florals. Keep your flowers consistent with your neutral theme. I chose white hydrangeas and fresh fern sprigs from my garden. They’ll enhance your table while keeping your look cohesive. 6. Keep it whimsical. 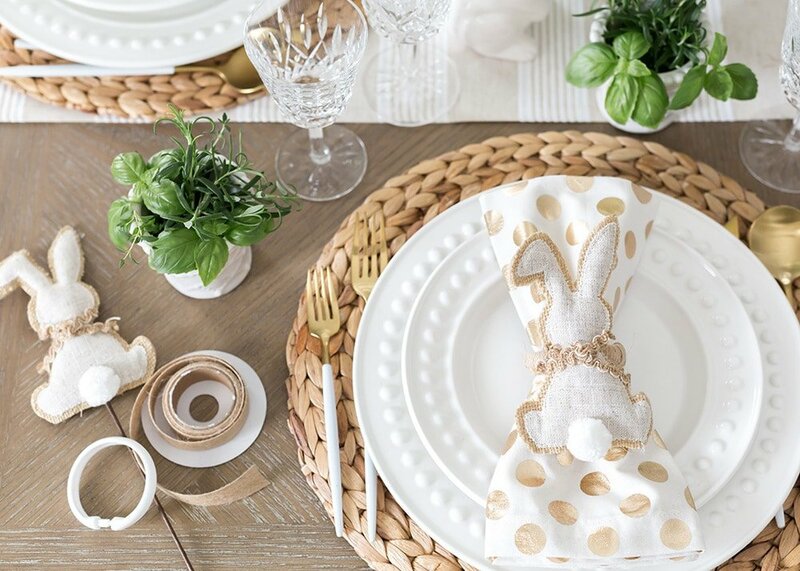 You can have a very neutral table while still keeping Easter kid-friendly and whimsical. 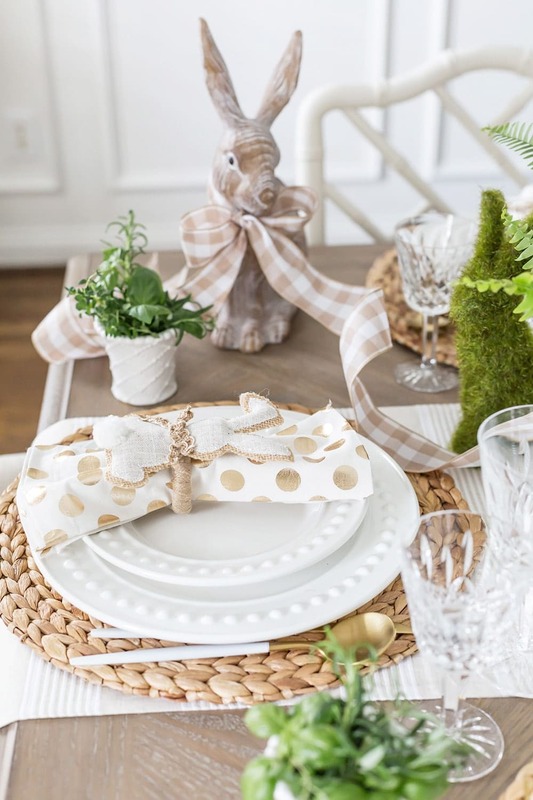 I added white and gold polka dot napkins with a burlap bunny napkin ring. The colors stay consistent, and I love the charm it adds to the table. 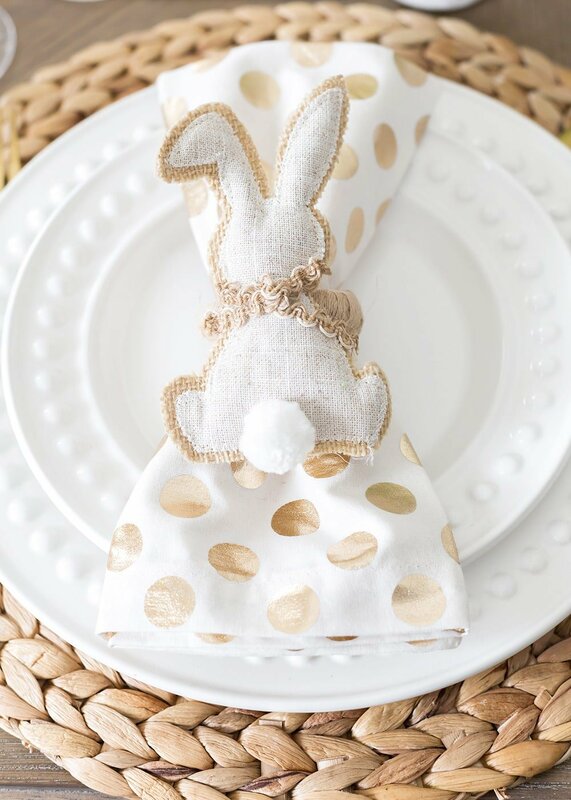 Learn how to make these bunny napkin rings below! 7. Gift herbs as favors. I love a sweet party favor. It’s certainly not a necessity, but if you have guests visiting for Easter brunch, adding a little something for them to take home is a sweet gesture. To keep my theme, I used simple white mini vases filled with potted herbs. Not only did my table smell amazing, the guests can use the herbs at home! Let’s talk about these sweet bunny napkin rings. They’re a simple (yes, SIMPLE) DIY that my Mom created, and I went ga-ga over! I love easy DIYs that won’t have you driving to four craft stores and spending $100. These, my friends, are easy. If you’re on Instagram today, check out my stories to see a little video of my Mom chatting all about how she made these sweet bunny napkin rings! It’s very easy! First step is to wrap a shower ring with your ribbon of choice. We selected a natural, thin woven burlap ribbon to keep our neutral color scheme consistent. You could choose any ribbon you want. Use hot glue to secure the last bit of ribbon on your shower ring. Michaels (and most craft stores) have a whole section for decorative “picks” that can be used in floral arrangements, wreaths, or other crafting. We found these burlap bunny picks. A simple wire cutter removed the metal pick. Then we hot glued the bunny to the top of our wrapped ring. You could add a decorative Easter egg as well! Take a little walk in a craft store’s holiday section, and you’ll be surprised at just how many items you could use on top of a napkin ring. 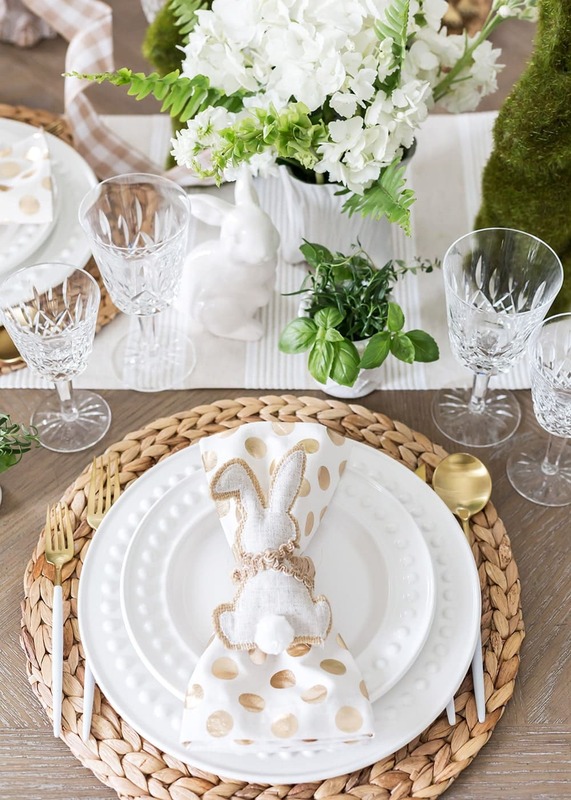 I hope you’re inspired to style a neutral Easter table! As always, if you have questions I didn’t answer above, please leave a comment below!